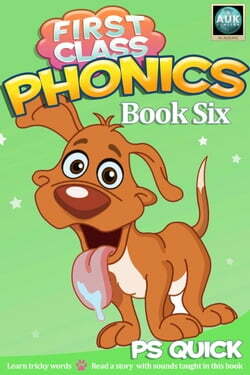 First Class Phonics is a series of books designed to help children quickly become proficient readers and writers.These books use Synthetic Phonics, a high-quality teaching method recognised all over the world. In Synthetic Phonics, children focus on the skills that enable them to read and spell... read more words accurately. They recognise the importance of every sound they hear in the spoken word and learn to blend these sounds so that they can read words from the very beginning of the program.It is essential that children develop the ability to hear, identify and manipulate individual sounds in order to read fluently. This book provides a range of fun activities to ensure this happens.Book 6 introduces more diagraphs (two-letter sounds) and trigraphs (three-letter sounds). It covers the sounds ed (yelled), ed(jumped), le (puzzle), el (funnel), al (medal), il (fossil), o (glove), ou (touch), tch (match), ey (money), y (pansy), ie (shield), wa (watch), qua (quad), kn (knight) and gn (gnome).In this book some earlier words taught cease to be tricky words as children learn new sounds and understand their spelling pattern. The last chapter contains a story that uses only words built from the sounds taught in this and previous books.